Within 250 miles of Rogers, AR. Northwest Arkansas Aquatics is proud to be hosting this private Fitter and Faster Swim Clinic with two-time Olympian Cammile Adams! Each session’s curriculum was designed by the coaching staff to work on exactly what the Sharks NEED! There will be a special parent’s session during each clinic. Scroll down to read more details and register for the session with your group today! The most important aspects of all 4 strokes are the foundations. Without a solid foundation of balance, rhythm, and timing, a swimmer will never be able to take their strokes to the next level! At this session designed for the Hammerhead, Great White, and Tiger Shark groups, swimmers will be in the water with Cammile Adams working on the foundational components of fly, breast, back, and free. There will also be a motivational speech and dryland component. Butterfly: One of the most challenging things to learn is timing in butterfly due to the amount of focus and coordination it takes to kick, breathe, and pull in the correct sequence. When your swimmer learns the proper timing and rhythm, you'll be amazed at the power your swimmer can generate and how smoorth and relaxed their fly can feel! Breaststroke: Breaststroke is unique because there is a moment in breaststroke where a swimmer has to be patient and simply glide through the water. Without this moment, a swimmer's breaststroke will never have the timing that will allow for smooth and powerful strokes. 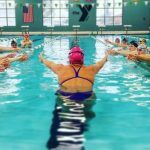 Cammile will work with swimmers on the when of each part of a fast breaststroke so that a swimmer is more efficient and powerful with each stroke! Backstroke: The power in backstroke comes from a strong core driven rotation. Participants will learn how to stay high in the water with a balanced rotation in order to get more length and strength out of every stroke. There is such a thing as too much rotation. Cammile Adams will help each swimmer find out how much rotation is right for them. Freestyle: Cutting through the water with an engaged core and a powerful rotation is the foundation for a balanced and strong freestyle stroke. By connecting arm pull and kick to the rotation, a swimmer will feel their body working as a single unit instead of each componet working alone! Motivational Speech: Participants at this session will get to hear a motivational speech from two-time Olympian and 2016 Olympic Team Co-Captain Cammile Adams. Swimmers will leave feeling more confident and encouraged to continue to strive to be the best they can be! Dryland: Dryland training has become more and more diversified over the last few years and even young swimmers are finding dryland workouts being built into their training. Participants will learn age appropriate, simple bodyweight exercises that will help them strengthen their core, and major muscle groups, so that they can strengthen their foundation. The most missed opportunity to get ahead of the competition is between the flags: off the start and through every turn. Your Mako, National Development, or National Team swimmer will learn from two-time Olympian Cammile how to maximize their power and speed in these essential components of a race. The things that they will learn at this clinic will help them take their swimming to the next level! There will also be a motivational talk and dryland component. Start: Get off the blocks faster and with more speed and power by learning from Cammile Adams! Your swimmer will learn to set up on the blocks in a position that will allow them to explode forward. Make sure to be fully engaged in the air as you throw your hands forward into a tight streamline. Your swimmer will learn drills and exercises that will help make them faster at this clinic! Flip Turns: Learn to carry momentum through the turn to get in and out of every wall with more speed and power. Swimmers will learn to use their core and arms to get their hips over and then plant their feet on the wall for a powerful pushoff in the perfect streamline. Participants will practice drills and exercises to help them master this athletic skill. Underwater Dolphin Kicking: Absolutely, undeniably, the fastest way to move through the water! Whether a swimmer dolphin kicks on their stomach, side or back, understanding the importance of streamlined, underwater speed is vital for every swimmer! Let Cammile teach your swimmer how to make the most of their streamline and underwater kicking, as well as teach them drills on how to improve upon those skills. Motivational Talk: Cammile will go over some very important questions that every swimmer must answer. These questions include: "Why do you swim? ", "What does it mean to be competitive?". Listen to a two-time Olympian and Olympic Team Co-Captain to become a more inspired and confident swimmer. Dryland: At this stage in your swimmer's career, flexibility and cross-training can greatly compliment their training. A good dryland program can improve coordination, prevent injury, and increase strength. Cammile will teach participants the importance of dryland as well as exercises that are perfect for swimmers! During both sessions, there will be a 60 minute parent discussion with Cammile's Dad, Eddie Adams. Eddie has coached age group and elite swimmers since 1979. He is a four time Texas High School Coach of the Year, has coached 5 Olympic Trials qualifiers, several age group and high school record holders, AND a two time Olympian. Eddie has a unique perspective on swim parenting and coaching and is eager to share his experience and thoughts with parents. Handling Expectations: Kids progress at different rates. Some swimmers achieve a high level of success at a very early age while others don't develop until later on. How do you handle not only your own expectations, but also your swimmer's expectations about where they should be throughout their year to maximize results and fulfillment in the sport? Swimmers will get to practice what they've learned by taking their stroke to their top speed with one of the best swimmers in the world! They'll work on holding onto their form while challenging themselves. Take a photo while wearing Cammile's medals, get autographs, and a gift from TYR Sport!